In the chilly reaches of alpine country, just two hours north of Vancouver, British Columbia, sits one of the hottest ski destinations in the world. Whistler-Blackcomb in beautiful B.C. Canada has two world-class mountains to ski. If you're planning a trip to Whistler, BC, Fresh Tracks will give you the insider Canuck info to give you the skiing adventure of your dreams. With a base elevation of 2,140 feet, the town of Whistler is populated by about 6,000 year-round residents. The average temperature is about 25 degrees in winter and 70 degrees in the summer. On average, Whistler-Blackcomb's 8000 acres of ski terrain receives a whopping 30 feet of snow annually! Between Whistler skiing and Blackcomb Mountain skiing, there isn't much better in North America. Whistler Mountain has 4,927 feet of vertical and over 100 marked runs. There are also over 100 runs available by helicopter access only. A cafeteria, restaurant and gift shops are located on the top of the peak, in case you don't get your fill in the village. Blackcomb Mountain, on the other hand, has about 200 more feet of vertical than Whistler Mountain and a similar number of marked runs. There is a nice restaurant near the peak that is worth visiting for the view, even if you aren't skiing. Both Whistler Ski Resort and Blackcomb offer great skiing and legendary one-mile vertical drops; the largest in North American and the equivalent of Europe's legendary resorts! Between the two mountains, there are three gondolas, 10 high speed quads, and 19 other chair lifts girdling the mountains, which is more than any other resort in the world. So if you can't decide which mountain you want to ski - try both. Both resorts are operated by Intrawest, so you can use your pass to access both areas. In the past 30 years Whistler-Blackcomb has gone from a sparsely populated town containing only a few homesteads to its present state, which mimics a Swiss alpine village. Whistler's history dates back to the early European settlers that migrated there in the mid 1800s. Originally called London Mountain by British naval officers, Whistler was so-named after a shrill whistling sound made by the western hoary marmots that lived among the rocks. Today, Whistler has become the fastest-growing municipality in British Columbia, Canada; however, the surrounding valley in all its beauty remains unchanged. A group of tiny lakes mirror the mountains rising high above the valley, including Alta Lake that divides the Sea to Sky corridor. The beautiful town of Whistler itself offers quaint local shops and beautiful 4-star restaurants. Not to mention, getting around is easy. Whistler and Valley Express (WAVE) provides a free shuttle services in the main and upper villages. If you're planning a destination trip for Canadian skiing, Fresh Tracks will set you up with the skiing adventure of your dreams. 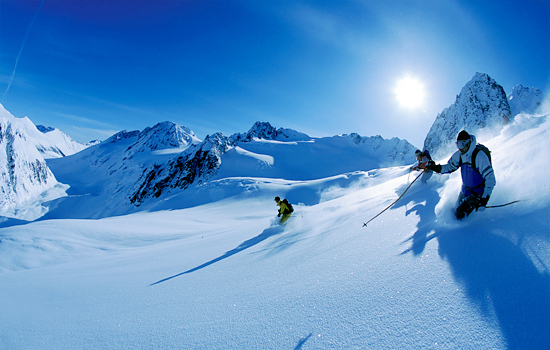 Need more information on Skiing Whistler Blackcomb? Talk to one of our Canadian travel Insiders who'd be happy to answer all your questions.